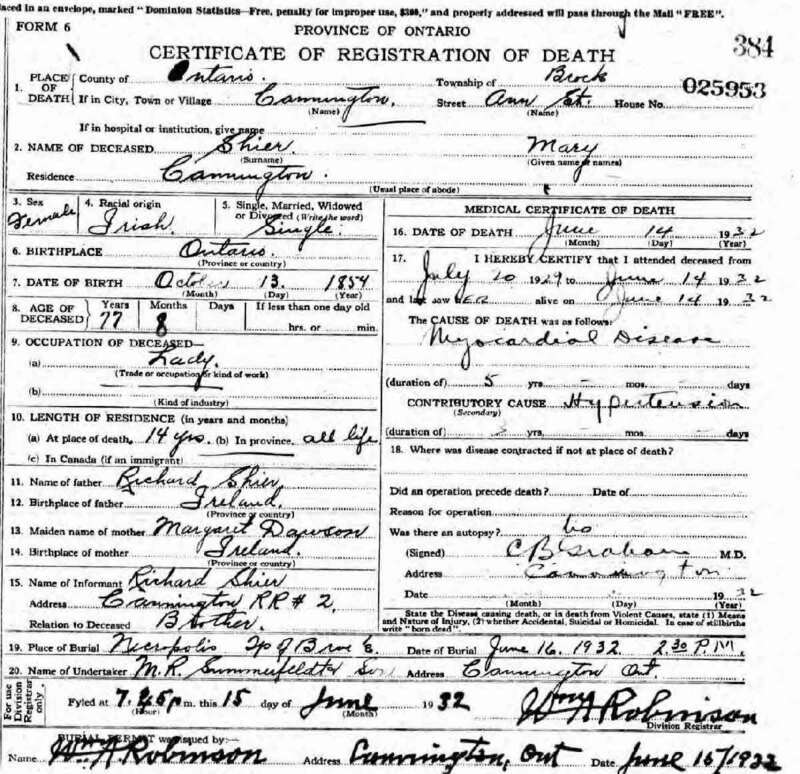 [S90] Manitoba, Marriage Index 1881 - 1937, online \, Index for the marriage of Colin S. Finlayson and Maria Shier. 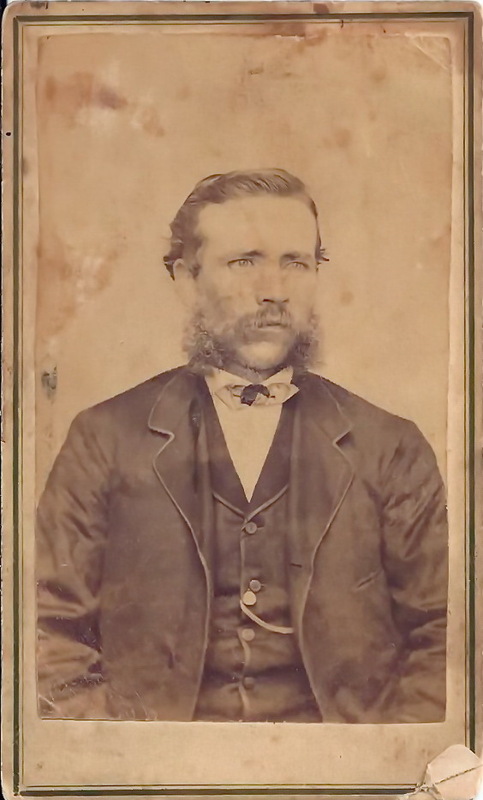 [S26] Unknown record type: unknown subject, by unknown photographer; unknown series; unknown repository, unknown repository address. Online unknown url; unknown file name. 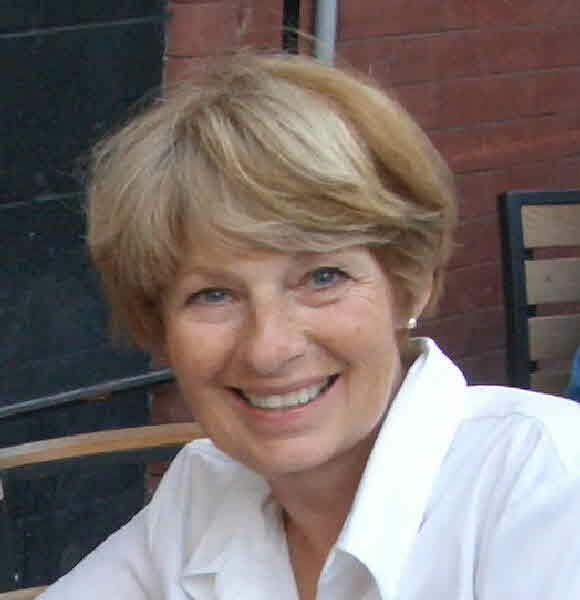 It is with great sadness that we announce the passing of Marie at Lakefield Extendicare in the presence of her adoring husband Gord and children Wendy and Mark, at the age of 71 years. Dearly loved wife of Gord for 20 years. Much loved mom of Wendy Ireland and her husband Jeff and Mark Elsden and his wife Kim. Cherished Grandma of Jane, Mitchell, Noah, Grace and Abi. 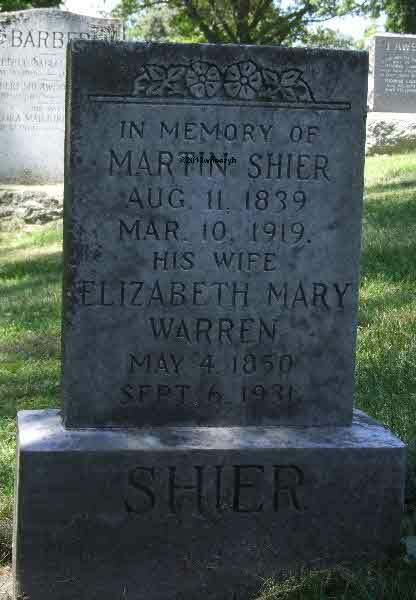 Predeceased by her father Fred Shier and mother Alice Shier (Kinghorn). 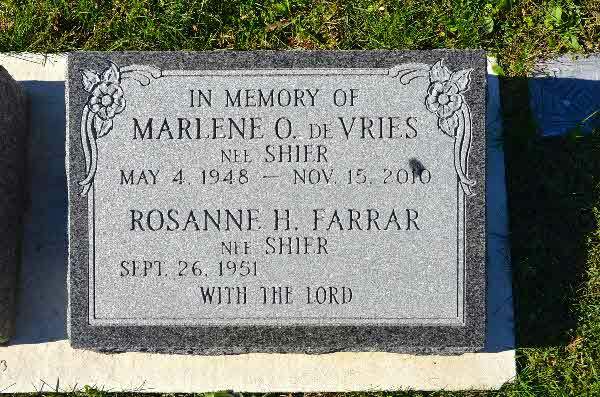 Marie was a loving sister and best friend to Carolyn Lowery (Tom) and Wendy Kobayashi (Les). 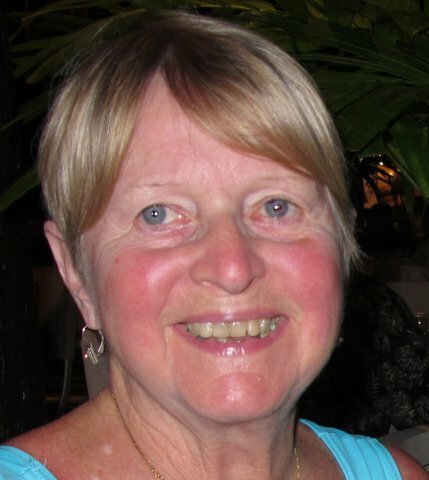 Marie will be remembered for her devotion to her family and her favourite pastimes – travel, gardening, walking, yoga, curling, Lionesses Club of Lakefield, Lakefield Red Hatters and Young’s Point United Church. She will be missed by all who were touched by her and especially by her furry baby Cleo. 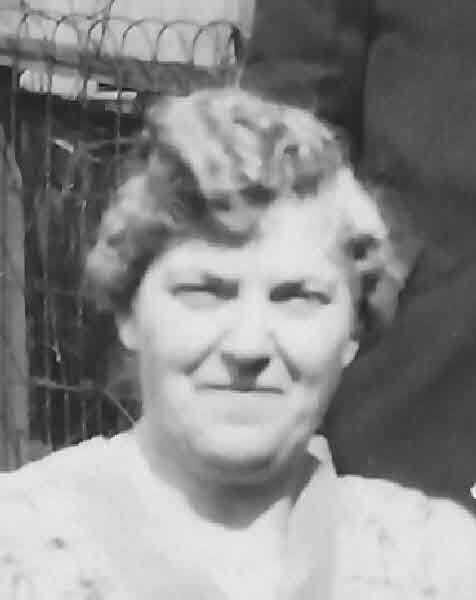 Marie’s career in Nursing included serving a short term at Oshawa General Hospital, and 25 years of service at General Motors, Oshawa. Marie’s family wishes to extend their heartfelt gratitude and appreciation for the care and compassion she received from the PSW’s, nurses and all staff at Lakefield Extendicare for taking such great care of Marie. Arrangements entrusted with Ashburnham funeral home, Peterborough. In accordance with Marie’s wishes, cremation has already taken place and a Celebration of Life will be held at Young's Point United Church, on Saturday March 5th at 1 pm with a reception to follow. 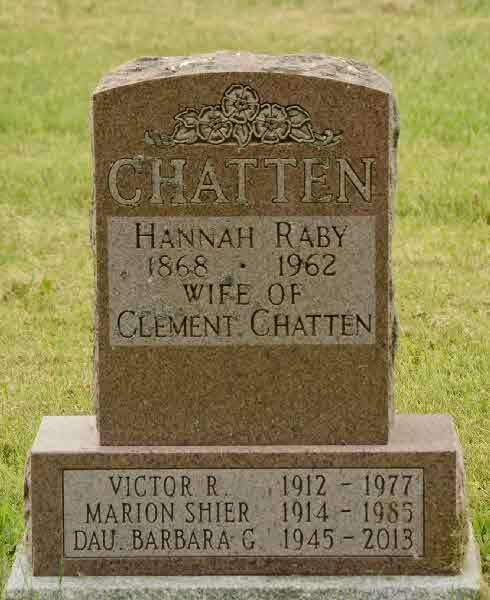 Burial* She was buried in Northbrook United Church Cemetery, Northbrook, Lennox and Addington County, Ontario, Canada. 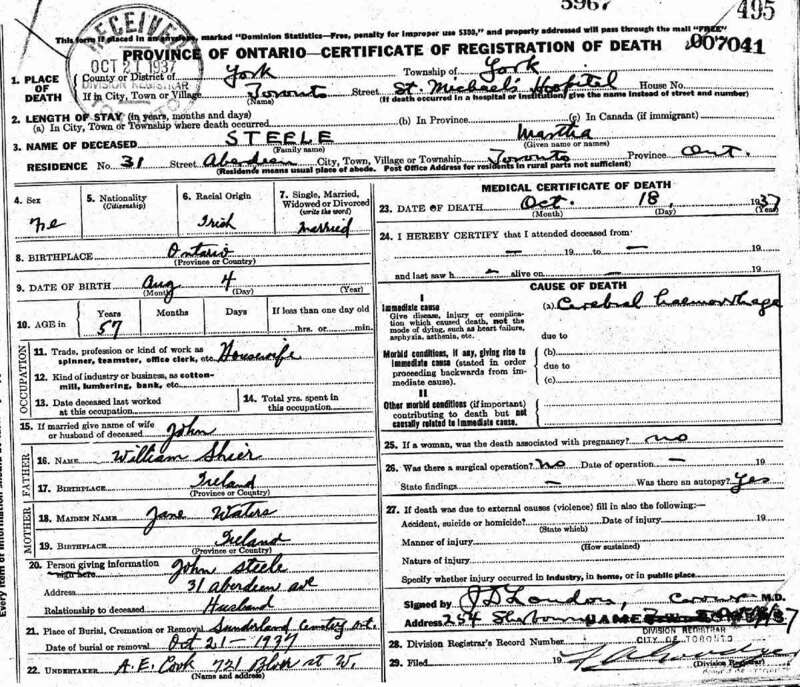 Burial* She was buried on 22 January 2011 in Sunderland Cemetery, Brock Twp., Ontario County, Ontario, Canada; Her initial funeral was held in Richmond British Columbia with a second service in Sunderland prior to her burial. 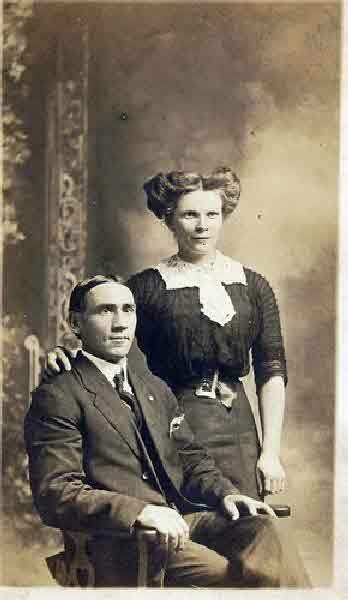 Marriage* Martha Shier married Henry Glendenning Waddell on 27 June 1883 in Brock Twp., Ontario County, Ontario, Canada. 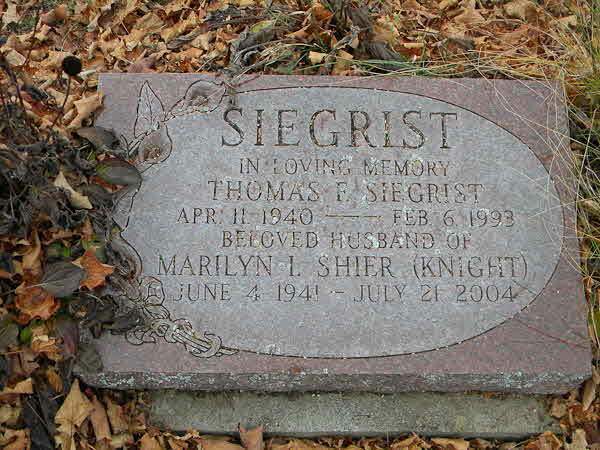 Death* She died on 11 September 1933 in Toronto General Hospital, Toronto, York County, Ontario, Canada, at age 70. 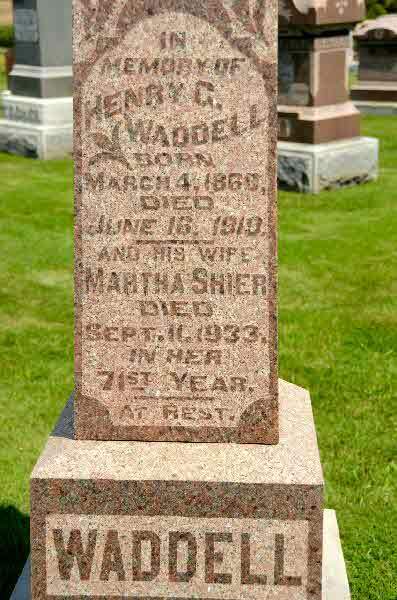 Burial* She was buried on 13 September 1933 in Sunderland Cemetery, Brock Twp., Ontario County, Ontario, Canada. 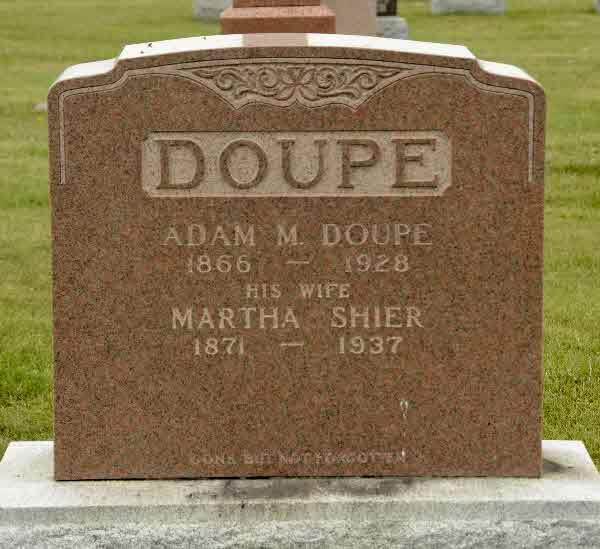 Marriage* Martha Shier married Adam Matthew Doupe, son of Henry Doupe and Lucy Leitle, on 15 February 1893 in Woodham, Perth County, Ontario, Canada; Married on same day as her sister, Catherine. 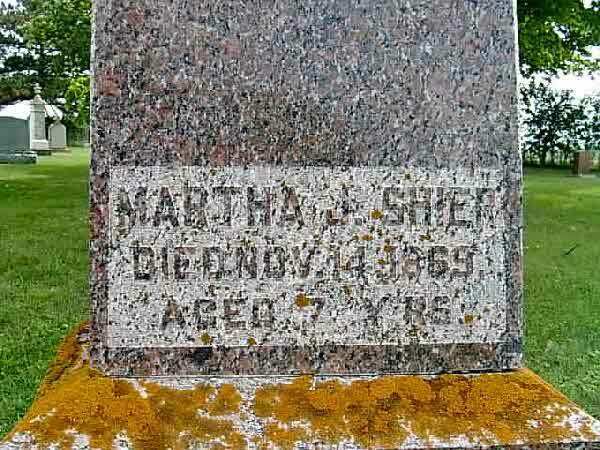 Death* Martha Shier died on 1 October 1937 in Blanshard Twp., Kirkton, Perth County, Ontario, Canada, at age 66; due to breast cancer. 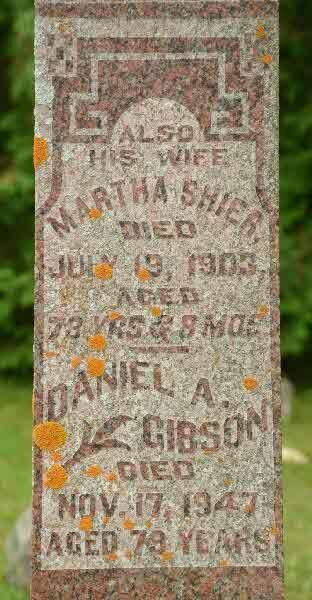 Burial* She was buried on 4 October 1937 in Kirkton Union Cemetery, Perth County, Ontario, Canada. 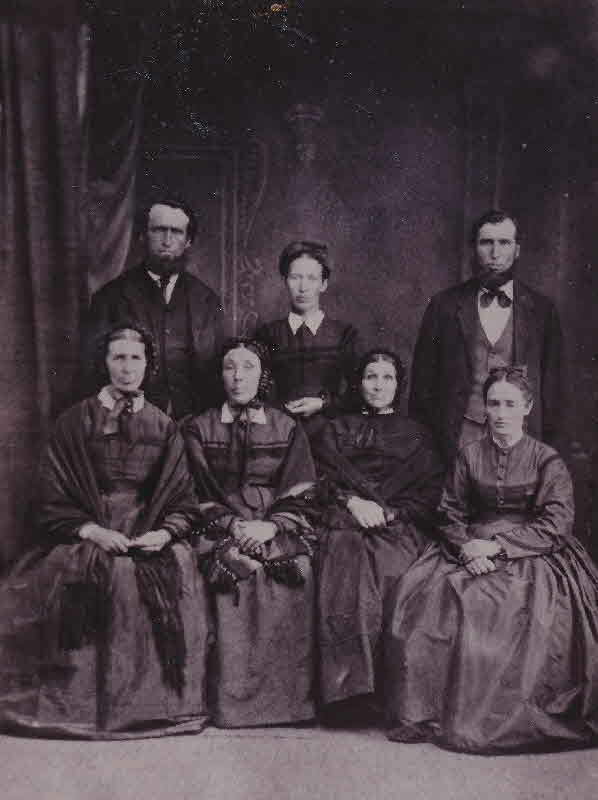 (Witness) Fact 1 Martha Shier witnessed the Fact 1 of Philip Shier; Photo of 7 of Jacob Shier's and Anne Sparling's Family. 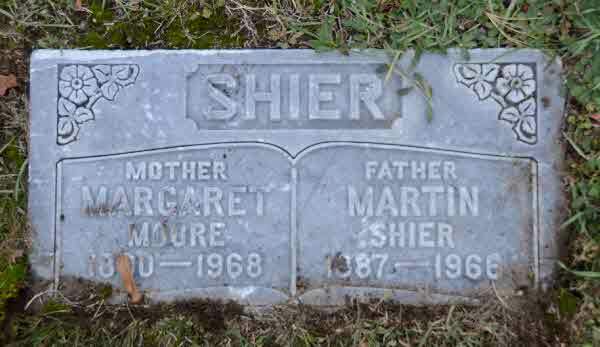 (Witness) Census Martha Shier appeared on the census of 1911 in the household of William John Shier in Orillia, Simcoe County, Ontario, Canada. 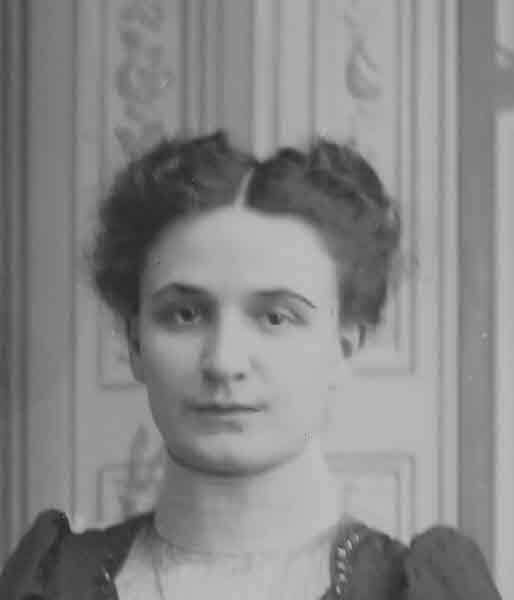 Death* She died on 18 October 1937 in Toronto, York County, Ontario, Canada, at age 61; Cerebral Hemmorage. 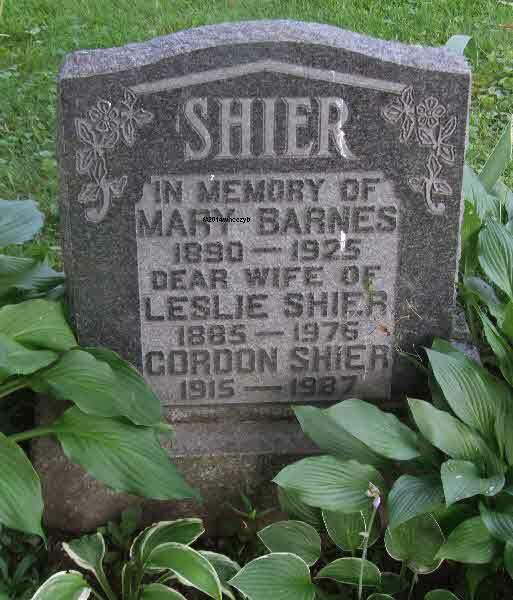 Burial* She was buried on 21 October 1937 in Sunderland Cemetery, Sunderland, Ontario County, Ontario, Canada. 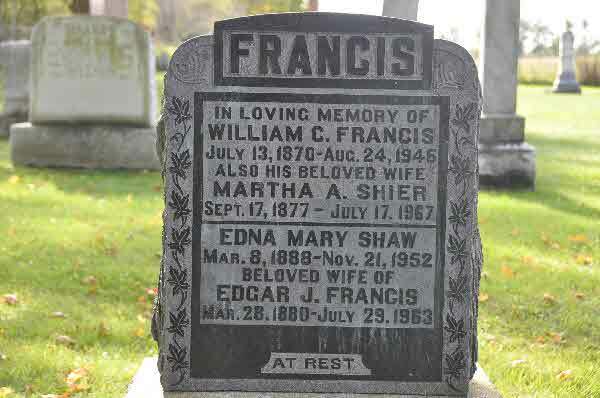 Marriage* Martha Ann Shier married William Francis, son of John Francis, on 1 October 1897 in Brock Twp., Ontario County, Ontario, Canada. 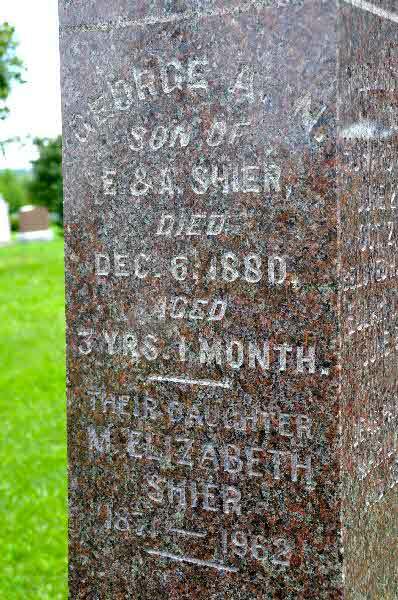 Burial* She was buried in All Saints Anglican Cemetery, Concession 11 Brock Twp., Ontario County, Ontario, Canada. 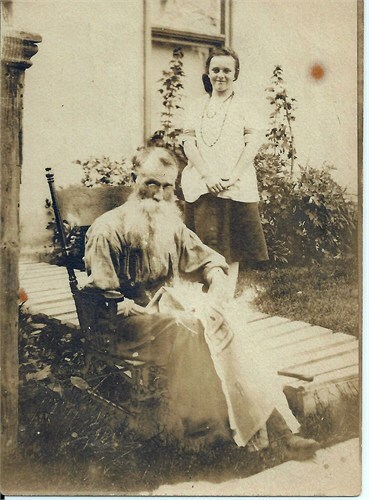 Birth* She was born on 2 April 1895 in Brock Twp., Ontario County, Ontario, Canada. 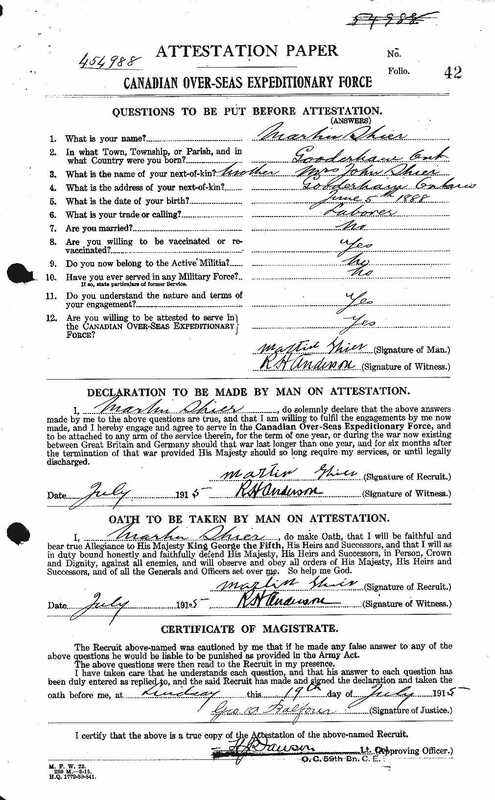 Milit-Beg* Martin Shier began military service on 19 July 1915 in Lindsay, Victoria County, Ontario, Canada, Canadian Over-Seas Expeditionary Force. Burial* He was buried in Glamagoran Twp. Cemetery, Gooderham, Haliburton County, Ontario, Canada. 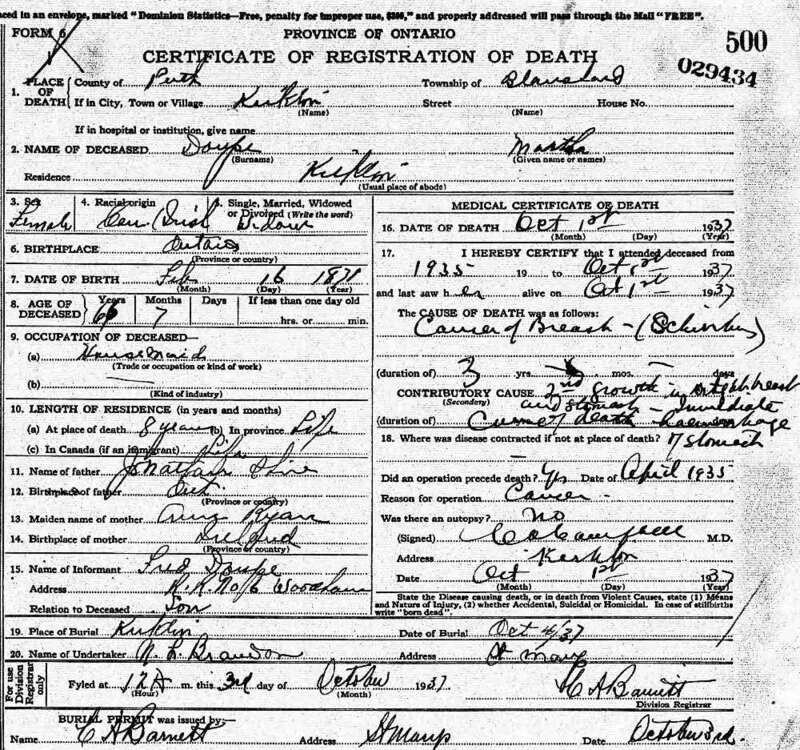 [S23] Unknown compiler address, Ontario, Canada Births 1869 - 1913, unknown repository, unknown repository address. 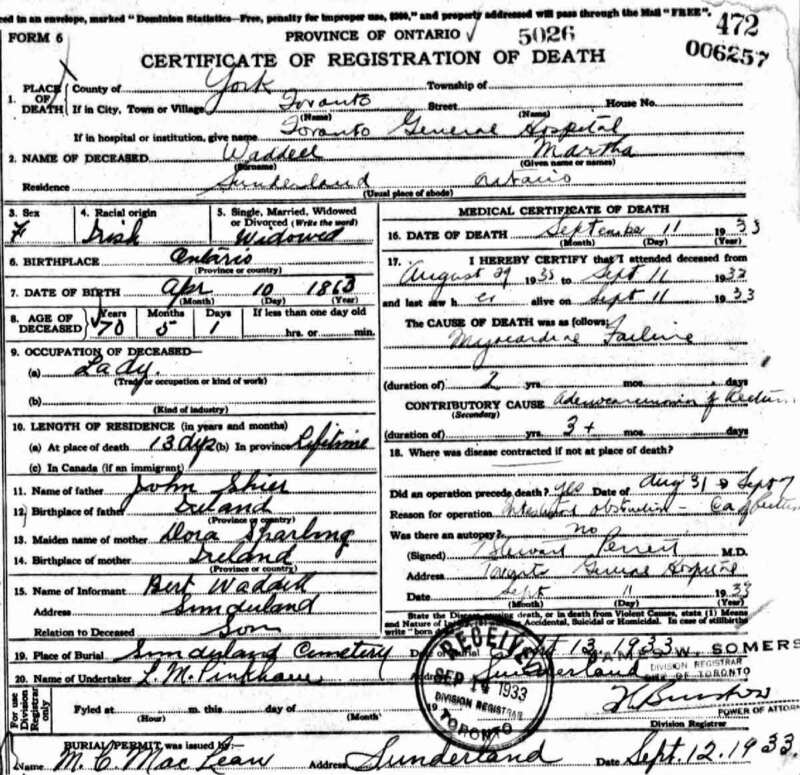 [S12] Shawano County Genealogy, online \. entrust me with I give and dispose of the same as follows. to my beloved niece MARY WINTER daughter of WILLIAM and ROSE WINTER late of Gibraltar deceased To Hold to her and her heirs and assigns forever subject to the payment of all my just debts and funeral expenses and making my Real Estate subject to the further Condition that if the said MARY WINTER shall die before marriage that the said Real Estate shall be sold as soon after her death as conveniently may be and the proceeds of such Sales be distributed by my Trustees herein after named in the following manner. That is one equal fourth part to MARGARET MUNRO of New Brunswick HANNAH McMASTERS and ELIZABETH TULLACK of Halifax daughters of HENRY SHIER late of Halifax deceased to be divided between them Share and Share alike and one other fourth part to my Brother JULIUS SHIER of New York or to his legal Representative in case of his death and one other fourth part to my sister ANN FOYE or in case of her death to her legal Representatives and the remaining fourth part to my beloved Nephew and niece WILLIAM and MARY ELEANOR BAKEWELL of New York to be divided between them share and share alike, And it is my intentions and Will that my said Niece shall immediately after my decease have and enjoy all my personal Estate to her own use forever and when she marries Shall have the free and uncontrolled use of all my Real Estate to hold to her heirs and assigns forever. 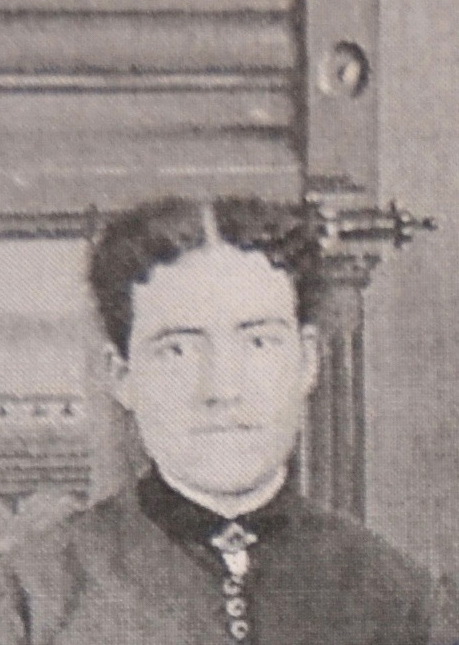 And I do hereby nominate Constitute and appoint my said Niece MARY WINTER Executrix and trusty friends JACOB MILLER, ROBERT SETSON, BENJAMIN ETTER SENIOR and JOHN SETSON Executors of this my Last Will and Testament herby revoking and annulling all former Wills by me made in Witness whereof I have hereunto let my hand and Seal this Twenty Ninth day of July in the year of our Lord one thousand eight hundred and fifteen. 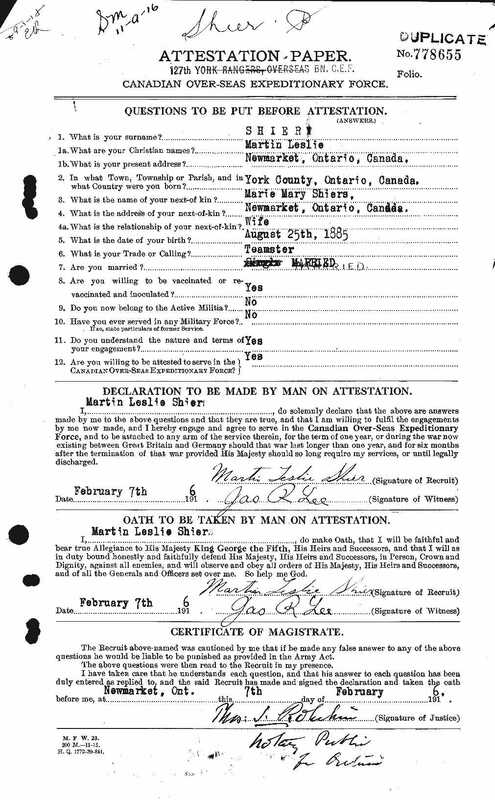 Milit-Beg* Martin LESLIE Shier began military service on 7 February 1916 in Newmarket, York County, Ontario, Canada. 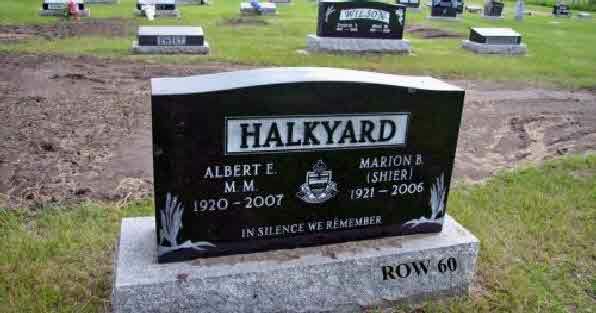 Burial* He was buried in Newmarket Cemetery, York County, Ontario, Canada. 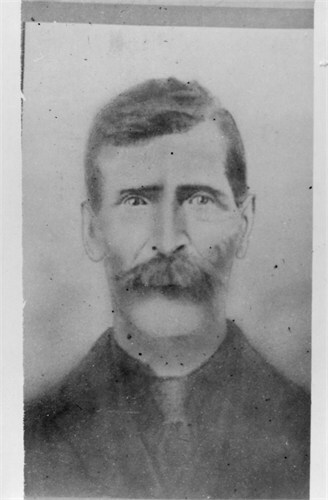 Death* He died on 30 July 1917 in Kaladar Angelese & Effingham Twp., Lennox and Addington County, Ontario, Canada. 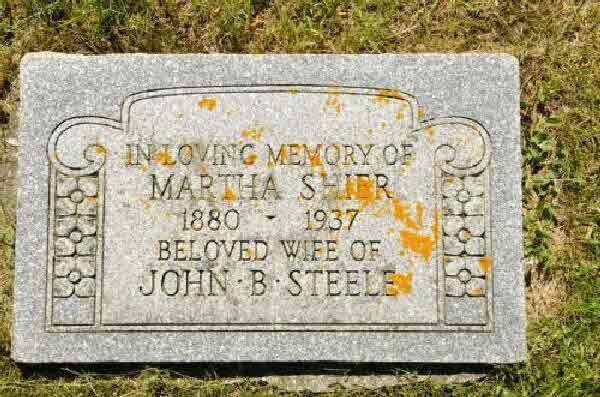 Death* Mary Shier died on 14 June 1932 in Cannington, Ontario County, Ontario, Canada, at age 77. 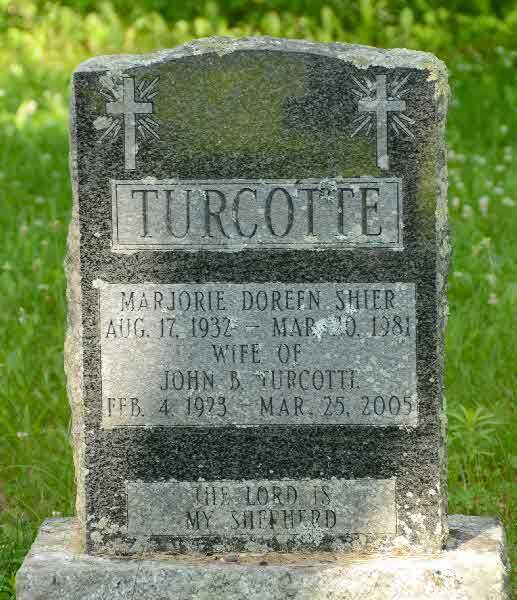 Burial* She was buried in Nercropolis Cemetery, Brock Twp, Ontario County, Ontario, Canada. 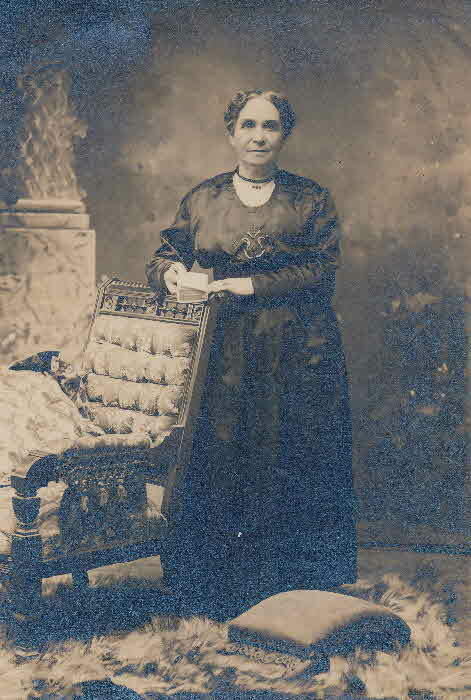 Birth* Mary Shier was born on 9 March 1873 in Blanshard Twp., Perth County, Ontario, Canada. 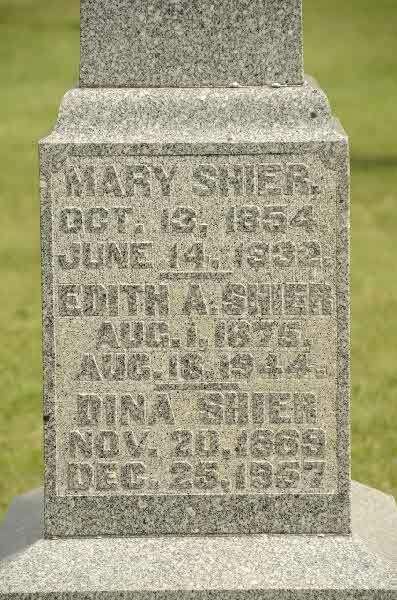 Death* Mary Shier died on 20 January 1879 in Usborne Twp., Huron County, Ontario, Canada, at age 5; due to diptheria. 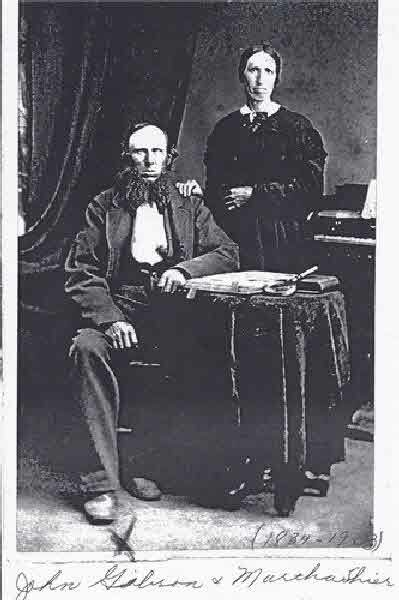 Marriage* Mary Shier married John Harris on 22 July 1880 in Brock Twp., Ontario County, Ontario, Canada; Reg Number 37326. 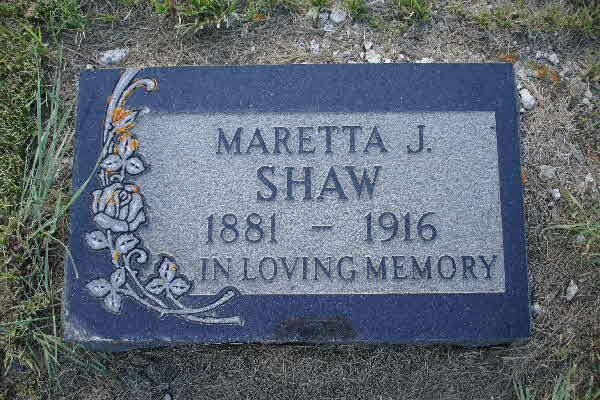 Death* She died on 28 February 1910 in Reach Twp., Ontario County, Ontario, Canada, at age 78; due to stomach cancer. 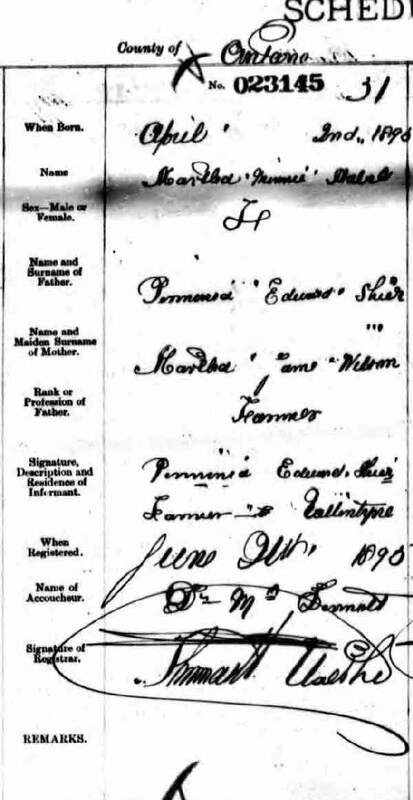 [S86] Ontario, Canada Marriages, 1826 - 1936, online \, Marriage of John Harris and Mary Shier.